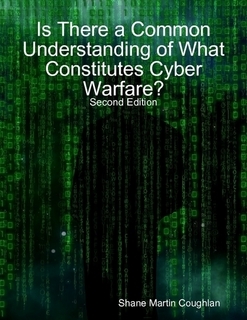 Is There A Common Understanding Of What Constitutes Cyber Warfare? Cyber Warfare is a complex and often misunderstood topic. As part of an MA degree in International Studies at the University of Birmingham (UK) I attempted to put the subject into an academic context. Underlying this research was the belief that it is vital to examine cyber warfare carefully and to invest time and manpower into the field. There are startling vulnerabilities to attack in existing digital infrastructure and at the same time astonishing exaggerations of threat levels being circulated. Cyber Warfare needs insightful and clear deconstruction to ensure targeted, effective investment of resources. In the twelve and a half years since this paper was originally published a lot has changed. My original introduction stated that “Cyber warfare is a relatively new addition to the lexicon of warfare” but this is clearly no longer the case. We live in an age of Digital Warfare and every major government has taken steps to address their national security policy in this context. It is my hope that the Second Edition of this research, released in modern digital formats to allow a broader readership, can contribute to the on-going discourse about how security policy can continually be refined to effectively address digital threats. You can also find this ebook on Amazon, iBookstore, the Barnes and Noble NOOK bookstore and the Kobo bookstore.